We are reckoned as one of the well-reputed Concertina Wire Manufacturers and Exporters from India. The materials used in the manufacturing of the Concertina Razor Wire are of optimum quality that ensures high durability, tensile strength and resistivity to adverse conditions. 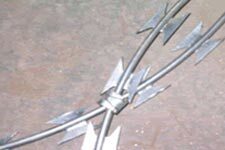 The same has made the Barbed Concertina Wire ideal for the extensive application in Defense and Government facilities, Borders, Prisons, Airports, Naval Ports, Nuclear Power plants and other high security sites. Additionally, customers are eased with the availability of the customized Concertina Wires as per the specifications provided. Concertina wire coils for mounting spiral of security barrier, specifically, reinforced twisted wire ribbon and concertina wire reinforced with barbed tape) Concertina coils, which are intended to create a highly efficient barricade and used as a temporary engineering (mobile ) or permanent (stationary) fencing for installation on land or on already existing fence. Our Razor wire barriers find an extensive application in Defense and Government facilities, Borders, Prisons, Airports, Naval Ports, Nuclear Power plants and other high security sites.